Creativity for Anyone, at Any Age! Engaging in creative activities, such as painting or writing, is a fun and easy way to keep our brains active and sharp. Research has shown that “making art … causes the brain to continue to reshape, adapt, and restructure” over time, which maintains and even enhances cognitive ability. Aside from these physical benefits, making art also has psychological benefits, including treating depression and anxiety. With this in mind, the Five to Thrive resident enrichment program at Avenida communities was designed to include creative arts classes and programs, to help promote and support Cognitive Efficacy among our residents. 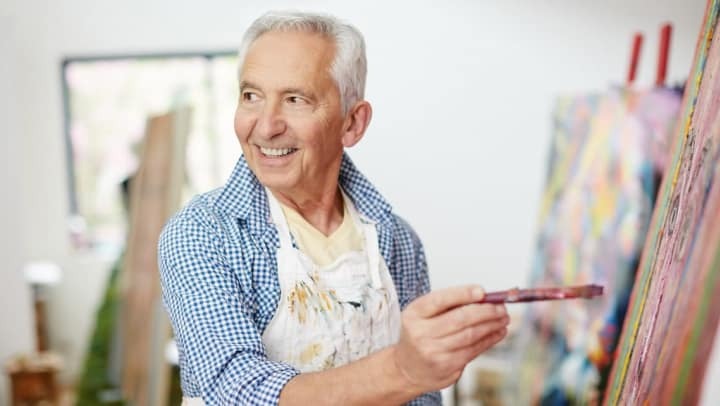 For an older adult with no experience making art, though, taking up a new artistic challenge might be seen as a fruitless endeavor. They may think that they are “too old” to learn a new skill—especially something as complex as creating art. And yet, we are surrounded by stories of individuals who didn’t discover their creative abilities until later in life. Doreen Pechey, a retired engineer, took her very first ballet class at age 61 and passed the ballet grade six exam at age 71. Former President George W. Bush took up painting at age 66 and discovered a true passion and talent for the activity, much to the surprise of his closest family and friends—including his wife! Creativity is a timeless activity—so enjoy!